As a committed and professional teacher you are no doubt on constant look out for ways in which things can be done better in your classroom, learning area, school or even school district. Indeed, the rise of social media and online sharing allows us to access more good ideas and content than ever before. I’ve said in the past that twitter and the subsequent links to blog posts, podcasts and research has been the key breakthrough I have experienced in professional learning in the ten years I have been teaching. Regardless of teachers’ commitment to professional learning, most (if not all) teachers I meet are looking for ways to do things “better”. Be it teaching and learning, planning, assessment, use of technology or the other myriad of areas that bring about enhanced learning experiences for our students. But what if that way of thinking is actually hindering progress? Being new to my role as Head of PE Sport, I know I have been guilty of looking at processes, planners, units, school sporting events, assessment tools and thinking to myself (and the team) how can we improve? How can I do them better? Perhaps, I/ we have been asking the wrong kind of question. It is not sufficient to do things better, we need to do better things. I would bet that every computer design brief before that point had included specifications of technical jargon like processing speed, screen lumens, amount of RAM and so on. What he did was break a pattern. With this provocation he got people thinking NOT about improving what was already there but thinking about making something completely new, going in a different direction and disrupting the whole technology industry. He sparked curiosity in the mind of designers and allowed them to begin thinking about Dylan’s songs…poetic, innovative and simple. In the case of Steve Jobs and Apple, the rest, as they say, is history. So what learning does this offer us teachers? Can we disrupt thinking in our world to break the mould and to take learning in a whole new direction? We need to stop thinking about how to do the things we do better, and the start thinking about how we do them completely differently. And we begin with a provocation like Steve Jobs did about what we actually want to end up with. That said, I also strongly believe, to quote Dylan, that ‘the times they are-a-changin’ and there is a global cohort of 21st century teachers who are rapidly bringing learning back to PE. I have to say that these types ‘report cards’ for PE do still serve as motivation for me to things differently. I’d like to end the post with a story. In 2005, the Association of Independent Creative Editors in America held a competition for sub-editors to re-make a movie trailer for the 1980 movie, The Shining. I‘m not sure if you will have seen it but its fair to say its no happy stroll in the park. Officially dubbed a psychological Horror, it stars Jack Nicholson in one of his most eccentric roles. The contest was to re-cut the trailer using the exact same footage. Editors were only allowed to change the music and the voice-over. New Yorker, Robert Ryang won the contest by applying an expert level of disruptive thinking, depicting the film to be a light-hearted family comedy drama about father and son bonding. I’m not suggesting that our past or current PE ‘story’ is a horror (well not across the board) but can we change what we have into a family-friendly classic? Can we design lessons that look like a Bob Dylan song? Can we create units that excite and engage students in the same way as Harry Potter or Star Wars? Is it possible to create mini #PEgeeks in our classes who are as passionate about movement, physical activity and sport as they are about screen time? 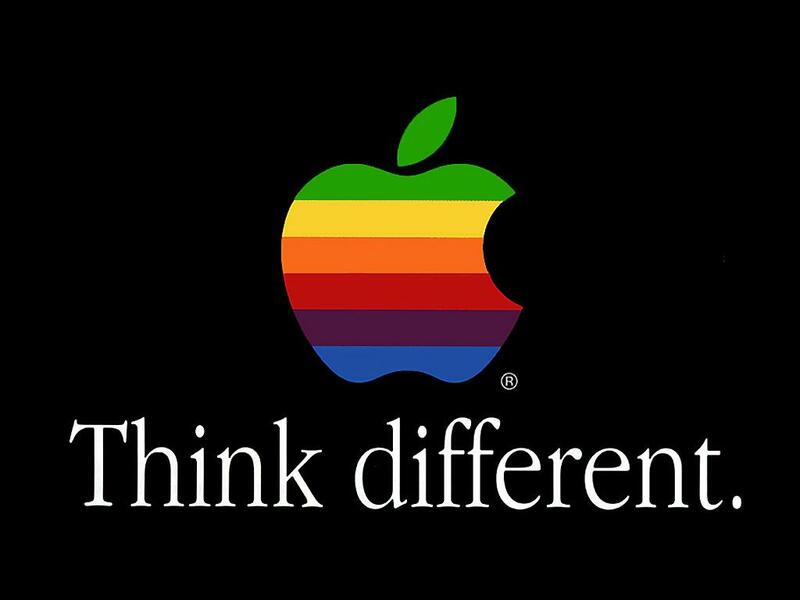 We may just have to take a leaf out of apple’s book and think different. *Credit: Luke Williams: Disruptive Thinking for the blog post inspiration. Exactly Ross! Loved this post. Thinking differently about the way we deliver our programs is critical to better engage our students. Also rather than focus on the’ how we are going to do this’ and the ‘what are we going to do’ in our programs, we need to look at it from the ‘why are we doing what we do’ perspective first. ‘Why’ is change necessary and ‘Why’ do we need to think differently. We will always be trying to improve what we do, but by thinking differently and creating change in our programs based on this style of thinking will make a difference in our own teaching and in the learning that takes place within our students. I don’t have the data to back up what I’m saying. What I say is based on gut instinct after my own 20-year journey as a teacher and a learner myself. Sometimes we just need to go with our gut instincts and believe that in our hearts what we are doing is best for our learners. The evidence will present itself to us over time. Thanks for the comment and wise words as always Andy. Its interesting to see educators like you do this naturally when it’s actually a fairly counter-intuitive way of thinking… Reminds me of Henry Ford too: don’t try to make the horse and cart faster, design the automobile! Dear Ross, I couldn’t agree more – there is no point designing better versions of things that aren’t working anyway. I agree Andy we need to ask “why” much more that we do, but we also need to ask “what is it that these young people need?”. Socio-cultural change has been driving the innovation process in almost every sector in the last 50 years but ours. I think essentially as physical education teachers, we are change agents by our very nature. We are seeking to bring about behaviour change (to influence the way people think and live positively) in our students and in our communities. When you start with that in mind you spend less time looking for the answers in unit plans and rubrics for assessment and more time investing in people. Jeremy, thanks for commenting and reading the post. I love your statement “there is no point designing better versions of things that aren’t working anyway” I also love your contribution around the topic of PhysEd teachers being change agents in their/our very nature, certainly food for thought. Your comments have helped to enrich the post and further the thinking and conversation around change, improvement and thinking disruptively. Keep up the great work and thank for connecting. Here’s to the crazy ones. The misfits. The rebels. The troublemakers. The round pegs in the square holes. The ones who see things differently. They’re not fond of rules. And they have no respect for the status quo. You can quote them, disagree with them, glorify or vilify them. About the only thing you can’t do is ignore them. Because they change things. They push the human race forward. And while some may see them as the crazy ones, we see genius. Because the people who are crazy enough to think they can change the world, are the ones who do. Another great quote by Apple. Thanks for the thoughtful comment. One of my favourite ads and really summed up the “thinking” and work if Apple at that time. I often take a moment to re-watch that ad and I love these words in the VoiceOver. When it comes to change and bringing about something completely new, distrusting the stays quo, cool, valuable and user friendly apple have blazed a trail from which we can all learn. Thanks for connecting- sharing and adding value to the post as you always do! I’ll never think of the Shining the same way again. A different train of thought is so powerful, but so hard to accept. It’s easy to “get into the groove” and keep doing what’s easy and you find to be successful. What’s hard is to accept different and possibly better ways of energizing the kids and making them want to move and adopt healthy and physical literate lifestyles. Well written, Ross. Very applicable across all educational and professional fields. Thanks so much for reaching out and joining the conversation. I’m glad to hear the re- cut version of the shining will stay in the memory, I think the family friendly version is definitely a better one to remember! I think its so Important each day/week/month/term to actually “get out of the groove” so we can reflect on the “why” we do things the way we do. Getting external perspectives from leadership, visiting other schools and getting access to quality PL is a huge part of that. There’s another group of stakeholders too who are excellent disruptive thinkers, where some of my best ideas have come….the kids. Thanks again for connecting- look forward to chatting more in the future. This is a really great post Ross and exceptionally timely given the impending national curriculum here in Australia. Jeremy has got it spot on when he says we can’t just keep trying to make things better that aren’t working. The new national curriculum is a fabulous opportunity for schools and teachers to put their programs and practice under the microscope. What aspects are working … for the teachers and for the students? What aspects are redundant in this brave new world. The new curriculum provides the flexibility to tailor your HPE programs to the needs of your students, so let them be active participants in the planning and development of your learning programs. After all they are the end users of our products! So nice to have you join the conversation- thank you! I will hit you up on twitter with an image I use in my talk this week about using and exploring the new curriculum in ways that engage and excite the kids in YOUR school. We know that that can be different wherever we teach. I love your term “brave new world” I think the future definitely requires brave (new or old) teachers who are willing to be creative, disruptive, imaginative and are able to inspire in kids a love for learning, physical activity and movement. Thanks again for sharing and enriching the conversation. Reading your posts creates a sense of excitement about what we can do given the projects we are working on re HPE curriculum in Victoria. We need to think differently about all things teaching and curriculum if we are to provide all children the chance to leave school “set up” for a lifetime of health and activity. I wonder how many children still consider PE the worst part of the day? If a simple question I used to ask my first year university students is anything to go by I am sure there are many. The question? How many of you had PE teachers who regularly used students as captains to pick teams? The answer – around 40-45%! You know the scenario from this point, as they get to the last few kids the comments of “you can have him, no you have him, NO YOU HAVE HIM AND HIS USELESS FRIEND! This is one of many examples of how we need to change. Yet if 38 years from when I had explained, and understood, in a PE methods class why using students as captains was not such a good idea this approach is still so prevalent it tells me we still have much to do to change the HPE experience of many of our children. Thanks for the comment. I agree, these are exciting times and teachers here in Vic especially are lucky to have the work of ACHPER to help support and implement new ways of doing things including the new AC-HPE. I’m always amazed to hear you talk about the things you have been pushing for a Number of years that still seem elusive in a lot of places. To think that at one stage disruptive thinking was required to find a new way to group students! I will be asking this Friday for teachers accounts of their PE experiences when they were at school- should be interesting! I line your reference to kids being set-up for a lifetime of Learning and activity. I’ve said before that we must teach for the next 60 years and. It the next 60 mins. As part of our disruptive thinking, we must analyse deeply how we future proof our curriculum and via which design(a) of pedagogy we achieve this. Thanks again for the valuable comment and contribution. Thinking outside the box is a great way of moving forwards and this post isn great acknowledgement of that. But sometimes the box itself is constraining. Sometimes, we need to move the box somewhere else and then think inside and outside of it. Sometimes we need to lose the box altogether and think of other shapes and other ways of doing things. Sometimes, perhaps, we need to put our students outside the box and ask them to look back at us and imagine different ways of thinking. This is a thoughtful post Ross and one that challenges us all to think (not just differently but consciously). As always I appreciate greatly your contribution to the blog thank you. I also must thank you as I actually to hunk it was you who fleetingly mentioned the topic of disruptive thinking that prompted me to explore further. The thing I leant fro you despite being in the it she side of the world! Your references to in/out and around the box thinking are terrific and demonstrate the exact kind of “manipulation of thought” we need to apply to tasks, processes, behaviours, content, workflow and pedagogy to name just a few areas to ensure we remain relevant, valuable and engaging in the eyes if our students. It’s not about knee jerk change every 5 minutes, fads or gimmicks, it’s about waking up each day and being able to analyse the roses instead of just routinely smelling them. Thanks for enriching the post Ash!